Maintaining nutrient levels in your soil is vital if you are to grow healthy plants. Therefore it is really essential to improve your soil regularly by digging in organic matter. These natural materials will absorb and hold water in the soil and improve its structure, providing essential air pockets for drainage and for the roots to breathe. The high organic content also encourages the activity of worms, which are vital for soil health. Follow the steps below to improve the nutrient levels and help your plants bloom! 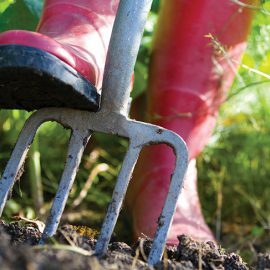 Dig over the area of soil that needs improving. Spread Westland Soil Conditioner or Gro-Sure Farmyard Manure over the surface of the dug area and work it into the soil with a fork. If you are trying to improve the soil in a fruit or vegetable garden, you could also try Gro-Sure Vegetable Growing Compost instead of the manure. ***If the area is planted then take care not to dig close to the plants or disturb their roots. Alternatively, use Westland Soil Conditioner, or Gro-Sure Farmyard Manure as a mulch applied around established plants and allow worms and soil organisms to work it into the soil.